When the Garman brothers won their 2016 Bronze Award, the NHQ judges commented that Jason, Mike, and Shawn were good builders but they needed to figure out where they want the south central Pennsylvania company to be in the next five years. Garman Builders had to identify and understand what would be required for future land acquisitions, capital, staffing, process, technology, and training to achieve consistent quality management. Three years later, this 2019 Silver Award winner has moved leaps and bounds from merely having vision, values, and a mission statement to formulating one-, two-, and three-year strategic plans with supporting goals and metrics to gauge progress. The trio became more proactive by forming a leadership team with department heads who collaborate on strategic planning six times a year with a consultant. The senior managers then share the plans with their departments. They also delved deeper into developing an organization that is system- and process-oriented. When departments recognize that a process is absent, they create one—as the construction department did by drafting a written policy to define the purpose of trade partner surveys and when and how to use them. Job prospects are screened using a 12-step process that grades applicants as A, B, or C players before selecting candidates for a series of interviews. New hires are onboarded into a customer-centric culture inspired by Steven Covey’s book, The 7 Habits of Highly Effective People with an experience that includes meetings with supervisors 30, 60, and 90 days after starting to review goals, expectations, and needs. 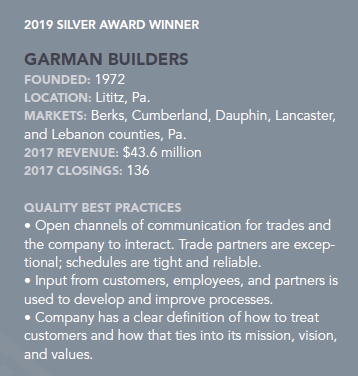 Garman generated $27.9 million in revenue, 74 closings, and had 43 employees when it was a Bronze winner. Last year the builder’s annual revenue was $43.6 million with 136 closings and 85 employees. The company aims to close 200 single- and multi-family units by 2020, and has an audacious goal to hit 500 sometime during the next 10 to 25 years. It’s also opening a $1 million design studio in January. NHQ and strategic planning have given the Garmans a better handle on land management. They use a system that correlates turns per year and how long it takes the builder to go from lot to house, with lot inventory, absorption by community, absorption by quarter, and other data to forecast how much land they need, when a neighborhood is going to finish, and what will be needed for the next community Garman is moving on to. Garman Builders is also in the beginning phases of analyzing market research to identify buyers. The builder is well acquainted with its base of 55-and-older customers, but there also are young families and other groups that can be organized by county and neighborhood into categories of people who buy for prestige, convenience, lifestyle, location, and other variables. The research so far has led to identifying 10 homebuyer groups. “We are early in that process, and as we go through it we will better be able to target who is our No. 1 buyer group, who is No. 2, and No. 3. That will allow us to also seek out land, lot sizes, and home sizes for those potential buyer groups,” Shawn says. 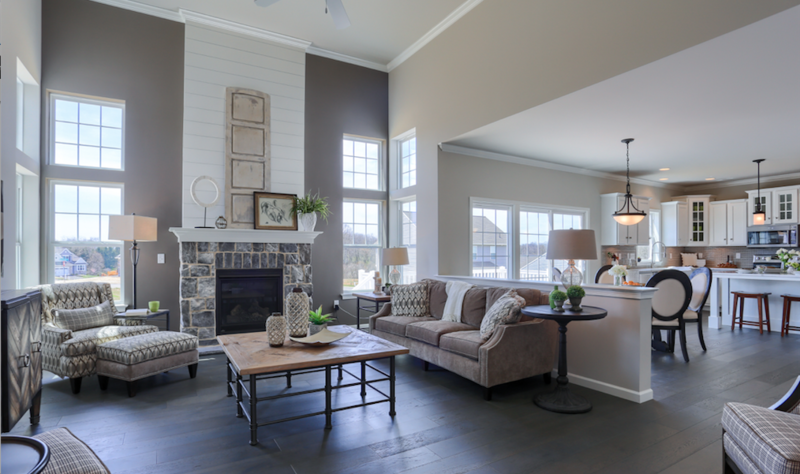 The great room in Garman's Davenport model. The Garmans knew back in 2015 that they build good houses, but they also understood that they needed to become business professionals if they wanted to scale up. Since then, they’ve operated with a mindset of finding and honing a process. During the on-site visit, one of the judges asked the brothers: If you had to leave town tomorrow and couldn’t check on the business for six weeks, when you got back, what would be the first two questions you'd ask to find out what was happening at the company?